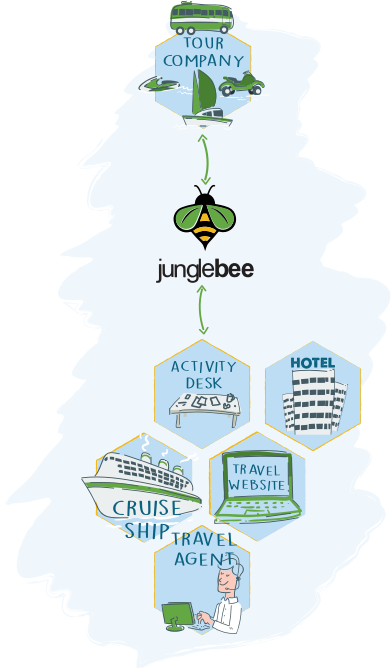 Welcome to Junglebee, connecting tour companies to agents. 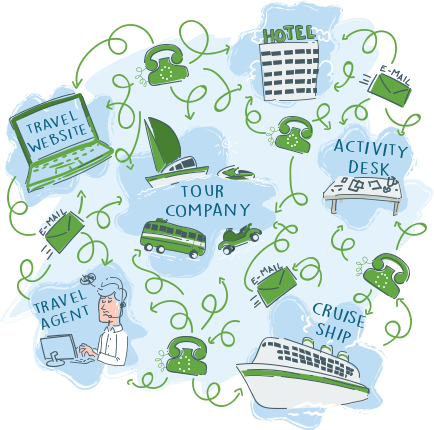 We connect tour companies to all agents (Activity desks, hotels, cruise ships, travel websites, travel agents) via our easy to use platform. With Junglebee, we speed-up the booking process, simplify reservation handling, reduce workloads and increase sales significantly. Are you a tour company that supplies boat tours, jet skiing, bus rides, snorkeling, diving, helicopter rides or any other type of activity? Access all your tour bookings from any device anywhere! Sell more tours, make more money! With our easy "Invite" tool, send login details to all your agents and partners to start booking your tours now. Not everyone needs to be able to do the same job in your company. Set special permissions per employee. You must know what is happening! How many bookings did you make last month? By whom? How? Let our reporting help! Once you've booked a customer, the easiest is to print them a good ticket with all the information they will need. Find all your customer's booking information in just a few seconds with our special "Customer Search" tool. Aqua Mania adventures is one of the biggest tour operators in the Carribean with +45 staff and +15 tours. They use Junglebee extensively for day to day operations such as checking availability, creating passenger lists and printing tickets. They receive +100 calls per day from hotel activity desks wanting to book their guests from 5 days ahead all the way up to a tour's departure. With Junglebee, Aqua Mania and all activity desks are completely connected allowing any agent to book instantly. For Billy Bones Boatcharters, switching to Junglebee was a no brainer because they manage 6 high speed powerboat offering three different tours. With so much action going on, anyone on the team needed to have direct access to the passenger lists and how much space is left! The owner, Balazs, was particularly interested in using Junglebee because he could invite all his agents/activity desks to book his tours instantly via the Junglebee platform. He no longer needs to run around with a pen and paper stuck to the phone! Captain Alan Boat Charters operates one of the oldest and biggest powerboat companies in St. Maarten. They use Junglebee to manage their customer bookings from hotels to reduce incoming phone calls and better manage their space. They were one of the very first companies to recoginze the need for a space managament platform like Junglebee and since using Junglebee, we have certainly simplified reservation handling for Captain Alan Boat Charters. Rhino Safaris is one of the most popular tours in St. Maarten. Customers love riding their own Rhino to snorkeling locations. For Rhino Safaris, using Junglebee was a natural choice as any customer at all local activity desks and hotels can immediately book their tours. With Junglebee, the Rhino Safaris team knows exactly where each booking comes from and by whom it was booked. The manager has full control and can view of all operations. Most of all, we make booking easier & increase sales!